Ayars & Ayars, Inc. recently completed a tenant finish for a new eatery in Lincoln, NE. After we finished a site and shell renovation to the Shoppes at Piedmont, the area was in need of a place where community members could come for a tasty bite! The Piedmont Bistro contacted Ayars & Ayars, Inc. and we collaborated to accomplish just that. View more project details here. 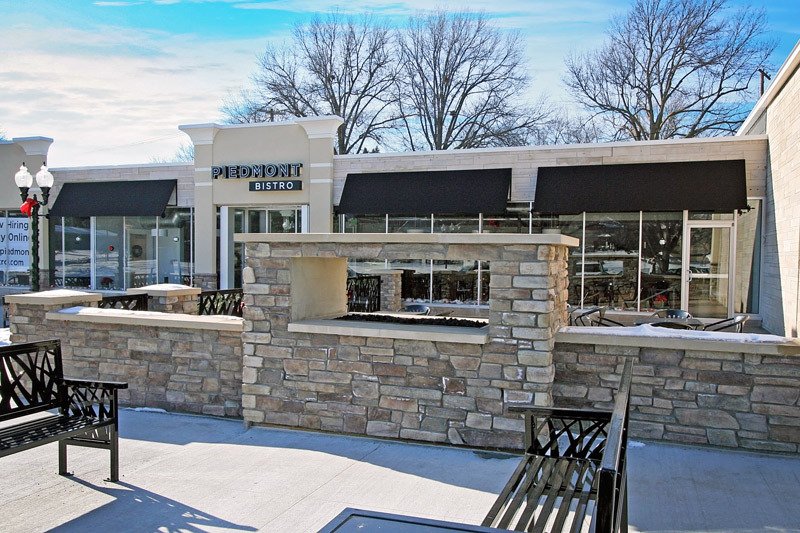 The Piedmont Bistro is located in the Shoppes at Piedmont, 1265 South Cotner Blvd. It’s a multi-service restaurant that provides more than just lunch and dinner. The bakery opens daily at 8 am and offers pastries, bread and daily soup to go. Reserve its 32-seat Lion’s Den Room for a meeting, party or another gathering. Or try the Sunday Brunch from 10 am -2 pm. The Bistro menu is built around three components; quality Nebraska meats, fresh greens, and wholesome grains. They believe there is something for everyone there to enjoy. Their wine list features the wines of the Piedmont region in northern Italy as a way to pay homage to their namesake, but also as a way to intentionally learn more about one of the great wine regions of the world. They hope you’ll find their place a comfortable respite.